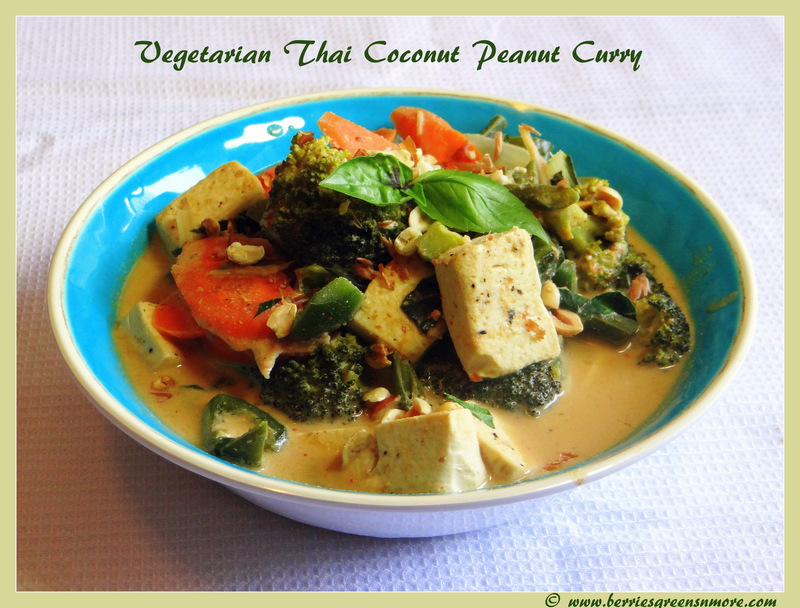 Vegetarian Thai Coconut Peanut Curry is my twisted version of the authentic Thai coconut curry; with minimum ingredients that can be found in any kitchen. This curry can be made in minutes. This curry is packed with vegetables, tofu and homemade curry paste made with coconut milk, peanuts and red chillies and flavored with basil leaves gown in my very own garden and some sauces. 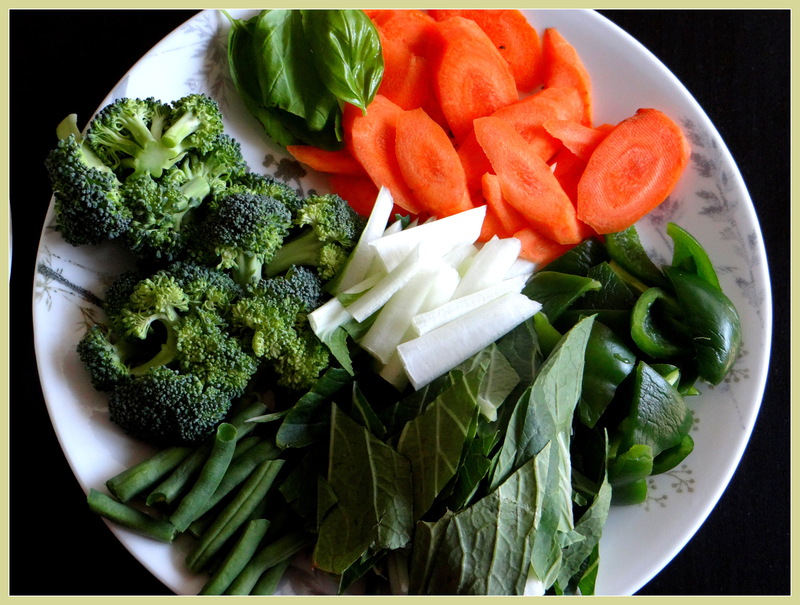 The choice of vegetables depends on your preference and taste. 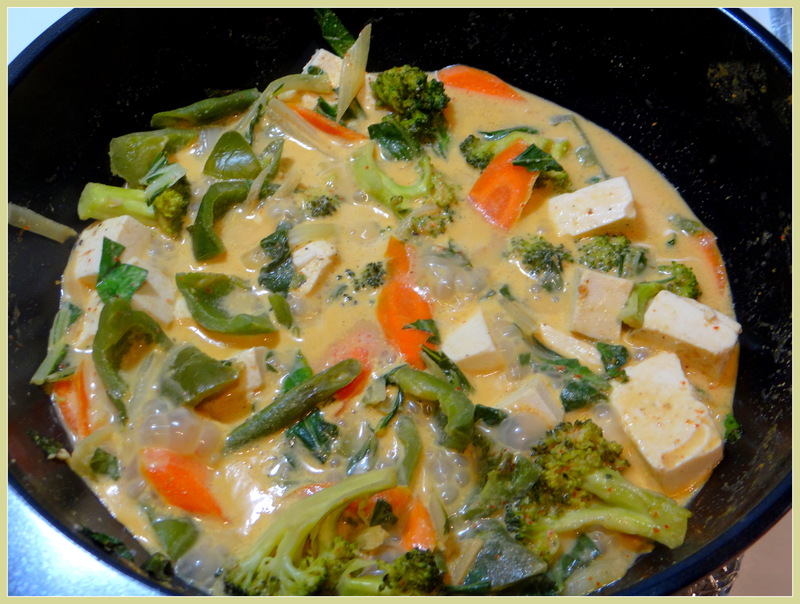 I made this curry with left over veggies I had in my kitchen but you can try it out with veggies like bamboo shoots, mushrooms, snow peas and the list is endless. 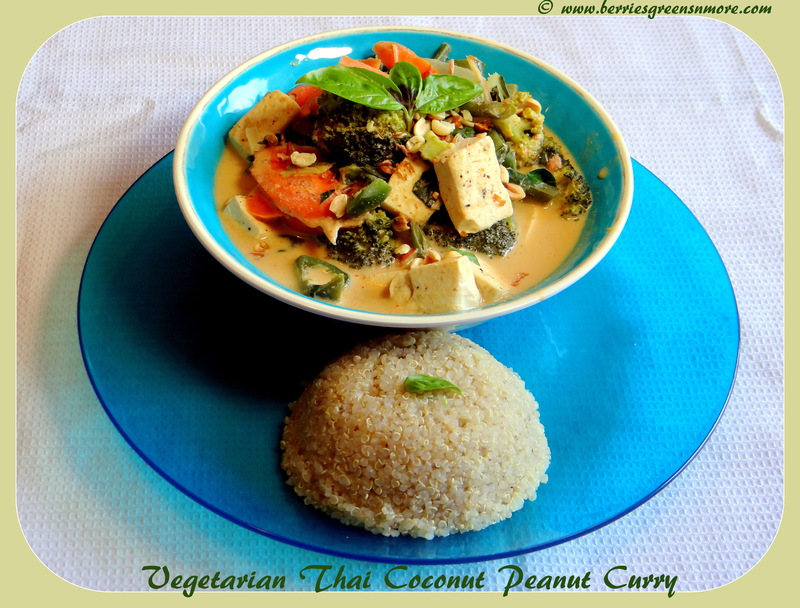 So, try out this amazing curry (my version) with no compromise on taste and happiness !! 1. To make the Curry, first we have to make a paste of the coconut milk, red chillies and peanuts by grinding it in a blender. 2. 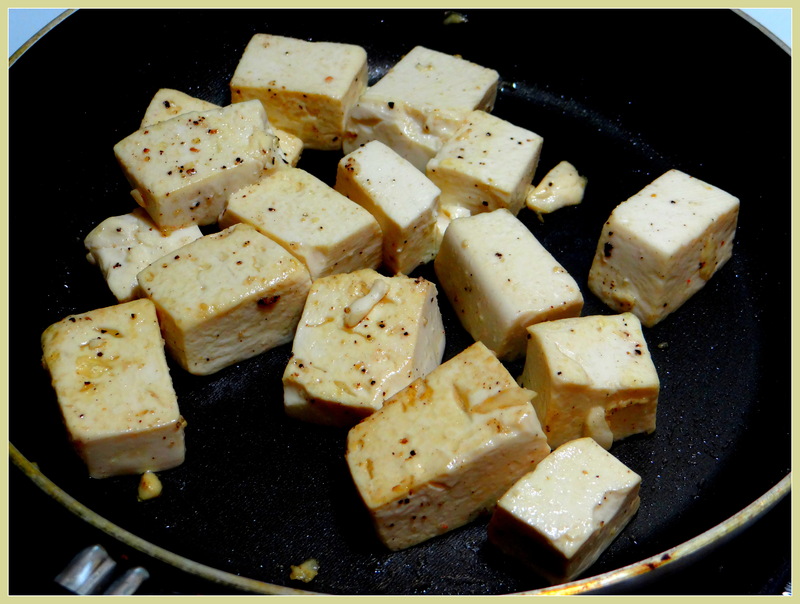 In a deep bottom pan, on high heat toast the tofu with some salt and pepper till lightly brown from outside but still soft from inside. 3. Now, in a deep bottom kadai / pan heat some coconut oil; add in the ginger julienne, chopped garlic and stir for 1 minute so that the flavors of ginger and garlic get infused into the oil. 4. Add in the vegetables except the bok choy and basil leaves. 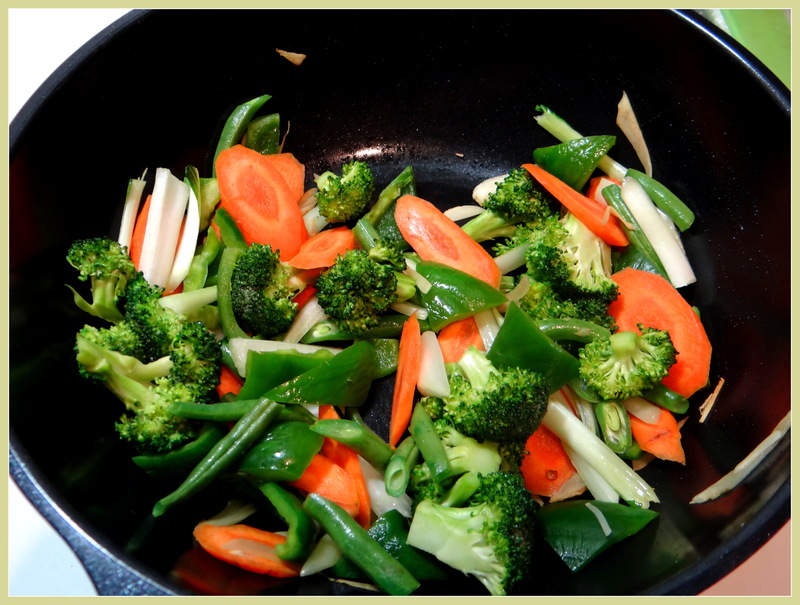 Stir fry on high for 2 to 3 minutes, so that the veggies get cooked but still retain their crunchy texture. 5. Now, add in the prepared coconut paste, liquid aminos, Apple cider vinegar, salt and some water to adjust the consistency of the curry. 6. When the curry comes to a boil, add in the tofu pieces, chopped bok choy along with the stems and basil leaves and switch off the heat and cover the pan with the lid. 7. Just before serving garnish with some basil leaves, roasted peanuts and serve hot with brown rice or jasmine rice. I like it best with Quinoa. Enjoy !! 2. 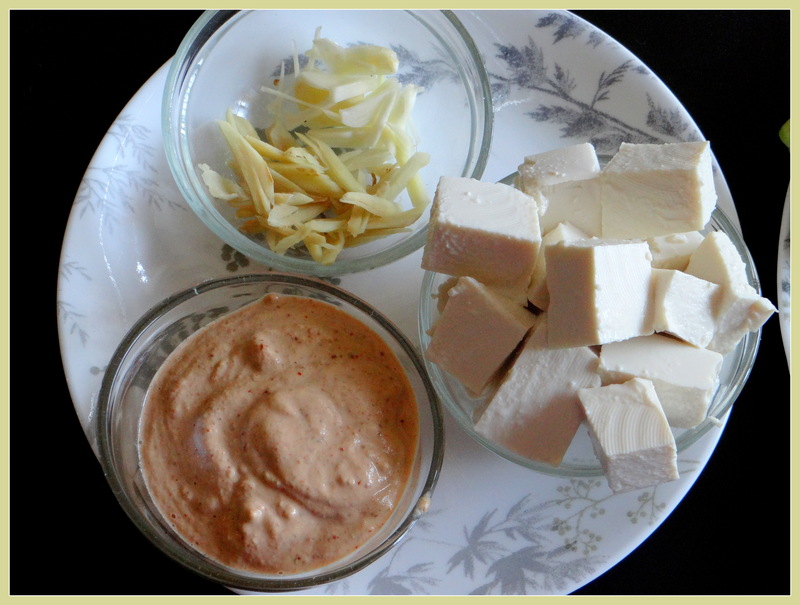 I have prepared it completely in vegetarian style but you can add in some boiled chicken pieces too. 3. 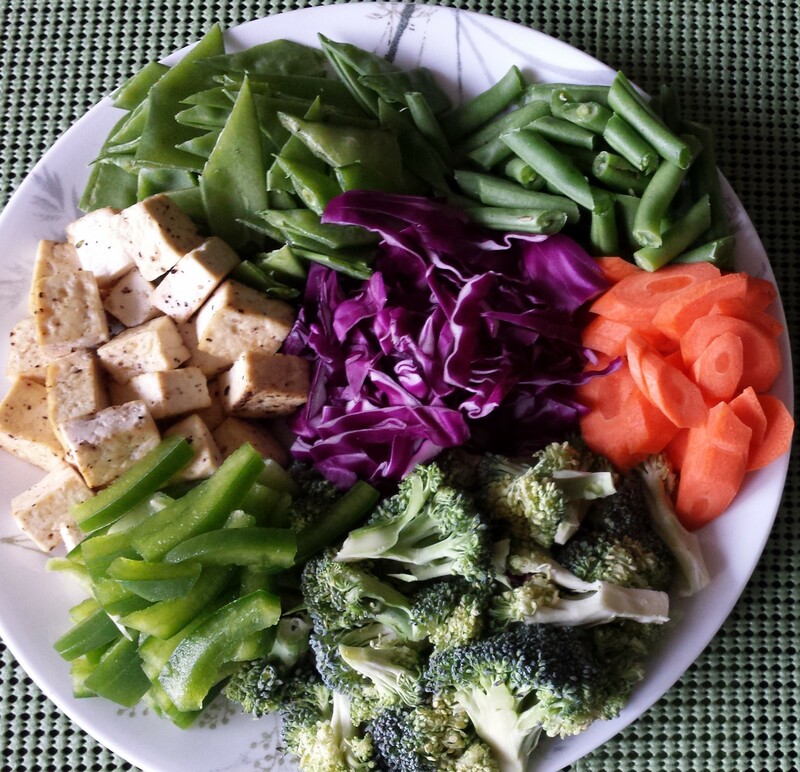 Liquid aminos is a great alternative to regular soy sauce. Since they are made with naturally occurring sodium from soybeans.